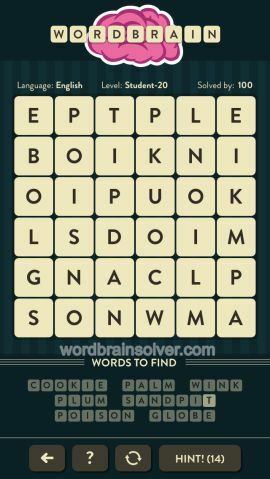 Wordbrain Student Level 20 Answers and Solutions. You cannot make the word Plum once you have input cookie, palm, wink. There is no way. Please,advise. Instead of “pumpkin” use “palm”. Sorry. I meant to say:When you make “palm” be sure to use the ” m” in the right side column. Then “plum” will be easy to make.